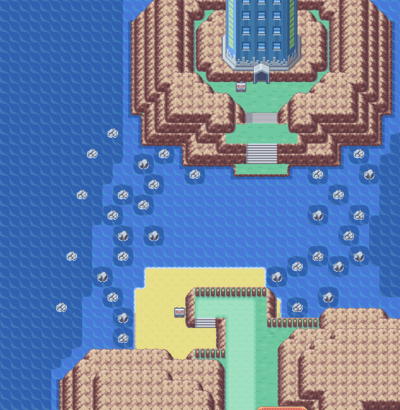 Seven Island is the last of the Sevii Islands, and holder of the strongest trainers of the game, aside from the Elite Four. Gear up and tackle the challenges within Trainer Tower, and make your way to solve the final puzzle within the Tanoby Ruins! Seven Island is the last of the Sevii Islands. 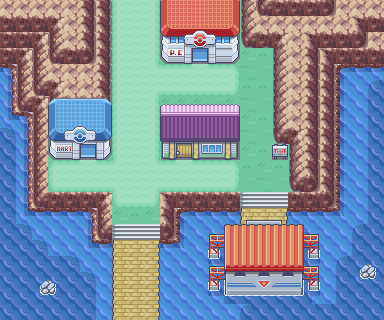 The town offers the usual amenities, such as the Poke Center and Poke Mart. A Move Tutor on the bridge south of the town will teach one of your Pokemon Swords Dance. There are two paths you can take. Head north and you'll encounter Trainer Tower. Head south and you'll go towards Sevault Canyon and the Tanoby Ruins. You can tackle them in whatever way you choose. Trainer Tower is the ultimate trainer challenge. Should you choose to climb it, you will have to go through eight levels of trainers to reach the top and claim a special prize. Battling the trainers here will neither give you levels nor money. The battles are timed, so try to do your best, and the level of the Pokémon here will match the level of your highest level Pokémon. There are 4 modes: Single Mode, Double Mode, Knockout Mode, and Mixed Mode. Heading north, you'll have to tackle two battles before you enter the Tower. Within, you'll find a Poke Center and a Poke Mart as well. The battles are unlike other challenges you may have found in different Pokemon games, as you are allowed to heal within and outside battles. Good Luck! All of your opponents in Trainer Tower have held items, and some are quite rare, so you may think of bringing a Pokemon or two that know Thief or Covet to get them! Single Mode are simply single trainer battles. Beat the eight trainers and you'll be rewarded with an Upgrade (to evolve Porygon into Porygon2 during a trade). Doubles are battles with couple trainers. Beat eight couples and be rewarded with a Dragon Scale (to evolve Seadra into Kingdra during a trade). Knockout Mode are battles where you will tackle three trainers, one after the other with no healing time between battles. Beat eight floors and be rewarded with a Metal Coat (to evolve Onix and Scyther into Steelix and Scizor during trade respectively. It also powers Steel type moves when held). Mixed brings a combination of all the previous modes. Beat eight floors and be rewarded with a King's Rock (to evolve Poliwhirl and Slowpoke into Politoed and Slowking during trade respectively. Also a Pokemon holding it will now have a chance to make the opponent flinch when attacking). Following the road south you'll find the entry zone towards Sevault Canyon. 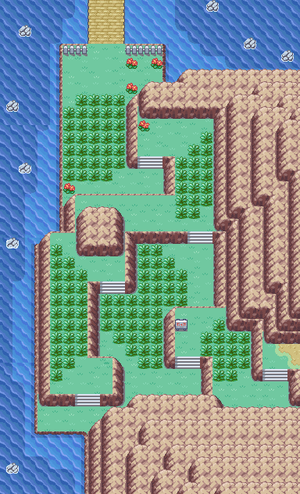 Canyon Entrance is a small zone mostly covered in tall grass, but you can also find challenging trainers here, so you may want to spend some time leveling your Pokemon here. From the middle of the zone, head south and east to continue on, the other path is a dead end. Here you will find the strongest common trainers in the game, so this is the best place to train your Pokemon. On the south part of the zone you'll find a house, which contains a man ready to dance with you. If you agree, your Pokemon will all be healed, so you can hang around this area for as long as you want. North of the area you'll find the cave known as Tanoby Key. Inside the cave is a puzzle that involves Strength. Once solved, you'll unlock access to Unown within the Tanoby Ruins. There are a couple of useful items that you can find throughout the road as well, such as the King's Rock, a held item that can make an opposing Pokemon flinch. Mind you, you'll need to bring Pokemon that know Strength and Rock Break to get it. When you are done with this place, head further south and enter the Tanoby Ruins. Solving the earlier puzzle in Sevault Canyon will allow you to capture Unown within these chambers! I know, a crappy reward for all the struggles you went through, but at least, you have finished exploring the Sevii Islands! Time to go back to Celio in One Island and deliver the Sapphire if you have not done so already. Now you will be able to trade and battle Pokemon from Pokemon Ruby, Pokemon Sapphire and Pokemon Emerald!!! Your delivery of the gems has now triggered new events. Head back to Kanto, the Legendary Pokemon await you!!! Phanpy, is a new Ground heavyweight Pokemon now available to you. And heavyweight is right. Once evolved to Donphan at level 25, this Pokemon gains a heavy boost to its attack and defense stats, along with a not too shabby HP. With these stats, Donphan can truly become a heavy hitter within your team. Be warned though, that its Sp Def and Speed stats are very poor, so any fast Grass or Water Pokemon can easily one-shot Donphan. Moreover, its learnset will not contain any Ground moves until Earthquake at level 49, so TM's will be necessary. Larvitar is another small Pokemon just bursting with potential. A Rock/Ground Pokemon, Larvitar follows the same progression that another powerhouse, the Dratini family. Like its Dragon counterparts, Larvitar, and its evolution at level 30, Pupitar,hold mediocre stats and movesets. Once it evolves into Tyranitar at level 55, however, its types change to Rock/Dark, and its stats shoot up into the stratosphere. Tyranitar can devastate most teams by itself, and will even learn Earthquake at level 61. Like Dragonite, Tyranitar will make an excellent addition to any team, so long as you are patient enough to reap the rewards. A Pokemon exclusive to Fire Red, Skarmory's defenses are off the scale, and also brings not too shabby attack stats as well. Skarmory's moveset is varied, focusing on physical attacks such as Air Cutter and Steel Wing, but can also learn Fly through the HM. As a Flying/Steel Pokemon, Skarmory makes for a great physical wall, but do not expect it to be anywhere near as speedy as Aerodactyl or Dodrio. A Pokemon exclusive to Leaf Green, Mantine, has decent stats across the board, except for a large Spc. Def, and a great moveset. Mantine's moves are very varied, including Wing Attack, Water Pulse and Bubblebeam. In addition, as a Flying/Water Pokemon, it can take full advantage of strong TM's and HM's such as Aerial Ace and Surf. Mantine makes a decent Spc. Def. wall and fighter, but it is easily outclassed by other Water Pokemon, including the similarly typed Gyarados. Unown, the Symbol Pokemon, is not known to evolve into any Pokemon, but in fact has 28 different shapes, one for each of the 26 letters in the alphabet, as well as the "?" and "!" symbols. Unown has mediocre stats all across the board, and although it is a member of the powerful Psychic type, there is no guarantee that it can exploit its type, as its one and only move is Hidden Power, a move whose type changes according to the Pokemon's EV values. It learns no other moves, by leveling or TM. Essentially, while Unown is a strange Pokemon, it'll provide little use to any team. Catch one for your Pokedex and leave it in your PC. This page has been accessed 231,751 times.